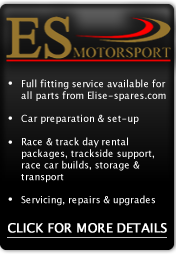 New to Elise-spares, we are happy to bring our on track race technology to our customers! As used.. This narrower focal view lens allows for a roll-cage mounted camera, situated further back in the..
5Ahr Li lon battery pack and charger. Approx five hours of use from a full charge. Upon order..
Standard 92 degree lens for high res camera. To install, remove lens cover and unscrew th..
Terminated in standard RCA and power sockets, this cable allows you to connect the video output o..
AV to DIN camera input adaptor cable for use with customer-supplied cameras. Standard bullet ..
3 metre camera extension cable for Video VBOX Lite, for both hi and lo-res cameras. ..
6 metre camera extension cable for Video VBOX Lite, for both hi and lo-res cameras. .. Clip on CAN Bus interface for Video VBOX and VBOX HD. Fits all vehicles which utilise a C..
Each two camera Video VBOX kit contains one camera mount ring, allowing for the camera .. Heavy duty suction mount for cameras. It can also be used with the VBOX LapTimer or OLE..
Sony HQ1 CCD high resolution bullet camera and windscreen suction mount. 3m cable leng..
Locking power supply cable for use with in-car 12v auxilary socket. 2m length. .. Replacement glass lens cover for Sony HQ1 cameras only. ..